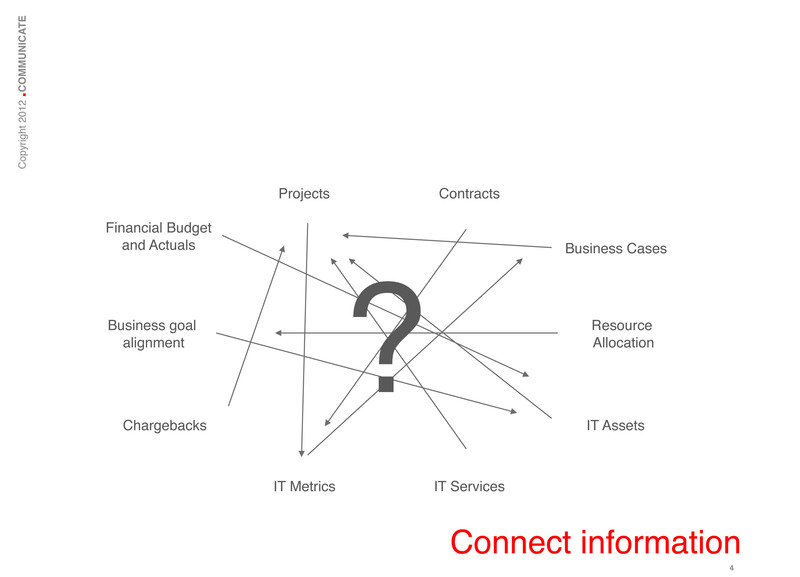 If your IT strategy looks like this then I would invite you to discover my new book Deliver Business Value with IT! – Design, Build and Run Effective IT Strategy execution to business needs. @ https://www.smashwords.com/books/view/290604 and soon also on apple store, Amazon, Barnes and Noble. “The execution of the defined business strategy is often a mystery (missing link) both on the Business and the IT side. The truth is that regardless of how well the executive team draws out the strategy in the boardroom the bottom line is that the business initiatives that were supported by clients succeeds, those not supported by clients (that do not get it) fail and disappear. “Deliver Business Value with IT provides a good overview of the ways a CIO can provide valuable and effective support to your company strategy. The reader will learn robust approaches to navigate the ever changing IT and global economic landscapes and deliver to next generation business drivers of IT architecture. “Deliver Business Value with IT” is an extremely solid piece of work that comes across as the A-Z reference of how to execute and implement IT strategy from a CEO and CIO level perspective. The CIO and IT department must focus on to support business objectives, the business strategy and to be able to demonstrate how they do this (that is to spell out a valid IT strategy and a value proposition to the business). To do so they need to manage IT like a business and be responsible to profit and loss. “Deliver Business Value with IT” has inspired me to approach the “how” differently, that is to think differently for the future development of IT services and the Enterprise (Business, IT) Architecture to support business processes, with IT processes (aggregated as services), applications and infrastructure. “Deliver Business Value with IT” is an extremely solid piece of work that comes across as the A-Z reference of how to execute and implement IT strategy from a CIO level perspective. The reader will learn robust approaches to deliver services designed to support IT and Business drivers. The perspective that Martin spells out permits an overview of how to leverage existing frameworks but also to effectively support the execution of an IT Strategy aligned with the Business Strategy. “Deliver business value with IT” gives an excellent practitioner’s view on how to realize value from IT investments. Martin successfully introduces the core theories and practices regarding this topic that recently had a lot of attention from both academics and practitioners. The material in his book also gives for CIO’s a good overview of the most popular IT governance and IT management frameworks including the relative new ones such as ISO 38500 and COBIT 5. This publication may help CIO’s and senior IT people to better understand that the only goal of IT is to support the business and that it is the business that ultimately will make profit from developed applications. “Deliver Business Value with IT ” is spot on. The role, use, provisioning, and expectations for IT are going through profound changes across the globe. The enterprise is demanding a higher velocity and more agile access to IT capabilities. Users are dismayed that they have better technology at home than they get in the business. IT is increasingly a part of or needed in direct support to the enterprise’s products and services. Stakeholders expect immediate, seamless access to transaction capability, information and analytics in their increasingly mobile work environments. IT leadership requires a refresh of approaches, thinking and management practice to meet these new challenges; thus the value of the contribution of “Deliver Business Value with IT”. “Deliver Business Value” with IT has for objective to set and influence the direction that the IT business relationship will take over the next few years. “Where traditional IT management focus on management & amortisation the approach “Deliver Business Value with IT” spell out demonstrates the way to the future position of the CIO as de guardian of effective investments providing innovative services to the business by new enabling technologies. The approach focuses on Enterprise Architecture as a way of managing changes in business processes and their IT support services. Competitive advantage in business depends directly on agile business processes and their support by IT. CIOs often struggle with legacy application due to the fact that their flexibility has disappeared. New emerging service delivery models such as SaaS, as PaaS or as IaaS provides an opportunity to reintroduce flexibility to IT services. As stated “Deliver Business Value with IT”, technology evolution does not free up the CIO from his role but in the contrary asks for even greater understanding of the new enabling technologies and how they can support efficiently the business processes. Required skills are shifting from in house server operation to the management of virtual servers provided by external suppliers. The end-to-end service delivery still remains under the responsibility of the CIO. And companies most valuable assets, knowledge and information, getting distributed over the cloud, require higher security measures. 4. How to provide effective IT Governance. There will be times when it will be more effective to buy services directly from Service Providers as opposed to building them in house. But those decisions should be made in a more methodical way. But, this will require for IT to administer a very effective and sound IT governance process. IT should be the keeper of the product and service catalog. (Rajesh Kumar, is a senior IT executive specialised in cloud, IT Transformation and IT Financial Management. He has held positions such as SVP Bank of America, IT Infrastructure and Finance and Director, Rackspace). (Gabriel Maties, Enterprise Architecture Manager, Gala Coral Group). (Romain Hennion de Thyses, Governance and Architecture Director, Global Knowledge, VP ITSM France).